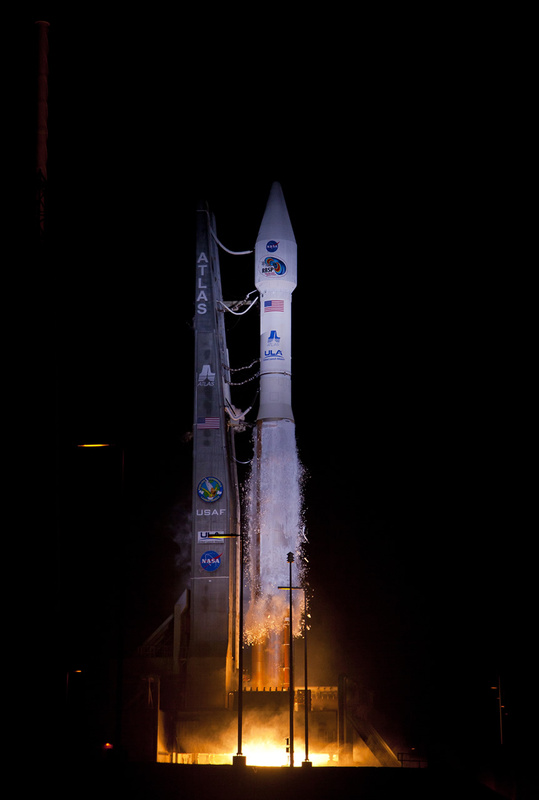 RBSP launched August 30 aboard an Atlas 5 rocket (Credits: Johns Hopkins Applied Physics Laboratory). NASA’s Radiation Belt Storm Probe Mission was successfully launched today from Cape Canaveral. After a delay of several days caused by tropical storm Isaac, at at 4:05 EDT (8h05 GMT), the Atlas V rocket carrying the twin spacecraft lifted off from Launch Complex 41 at the cape. Approximately one hour and twenty minutes later, separation of the first spacecraft took place, with the second following twelve minutes later. “The excitement of seeing the spacecraft in orbit and beginning to perform science measurements is like no other thrill. The entire RBSP team, from across every organization, worked together to produce an amazing pair of spacecraft.” said Richard Fitzgerald, RBSP project manager at the Applied Physics Laboratory (APL) of Johns Hopkins University (JHU). The highly eccentric orbit into which the spacecraft were injected will take them through Earth’s radiation belt – also known as Van Allen belt, in honor of its discoverer, Dr.James Van Allen. The radiation belt is a toroidal shaped region where charged particles from the Sun are trapped by the Earth’s magnetic field, and it plays a fundamental role in space weather conditions. After the successful launch, the two probes will undergo commissioning over the next two months, during which spacecraft operators will power up and check out subsystems and deploy the spacecraft’s antennas and sensors. Once the commissioning is complete, nominal science operations can begin. Data from the spacecraft will not only help scientists improve their understanding of the radiation belt, but will also be of use to spacecraft designers and operators, due to the detrimental effects that solar activity causes on spacecraft. The two spacecraft were built by the Johns Hopkins University Applied Physics Laboratory, which also manages the mission. The spacecraft carry five different instruments from several universities, institutions and corporations, including the University of Iowa, Van Allen’s alma mater, and the National Reconnaissance Office, designer and operator of the United States’ reconnaissance satellites. The Radiation Belts Storm Probes Mission is part of NASA’s Living With a Star Program (LWS), which aims to deepen current understanding of the effects of solar activity on the solar system and on Earth in particular. Other LWS missions include NASA’s Solar Dynamics Observatory, in operation since early 2010, and Solar Probe Plus, a solar orbiting mission currently in development and scheduled for launch in 2018.